When using any kind of paint, there are certain safety precautions that artists, household painters and commercial painters need to be aware of. The U.S.
Enamel paint can be used with a brush, roller or as a spray. When using any kind of paint, there are certain safety precautions that artists, household painters and commercial painters need to be aware of. The US. Department of Heath and Human Services provides health and safety sheets for enamel paints, which give information on the hazards and safety procedures for individual products, but there are basic rules that apply, whether using oil-based or water-based enamel. Oil-based enamel paints and the solvents used to thin them produce hazardous fumes that can cause respiratory problems, headaches and dizziness. Wear a respirator when using oil-based paints. While water-based paints emit less dangerous fumes, the area must be well-ventilated when using any kind of enamel paint. Use a spray booth with an exhaust system when using spray enamel, and wear a respirator that fits properly. Respirators should be NIOSH/MSHA approved. In case of overexposure to fumes, move to fresh air immediately. Consult a doctor if symptoms continue. Keep hands clean, and wear neoprene gloves if using oil-based enamel or any kind of spray enamel. Clean hands of oil-based enamel with vegetable or baby oil. If water-based enamel paint splashes onto the skin, wash hands thoroughly with soap and water and rinse well with clean water. Ingestion can cause poisoning from the pigments, glycols or methyl alcohols that may be present. Do not ingest enamel paint. 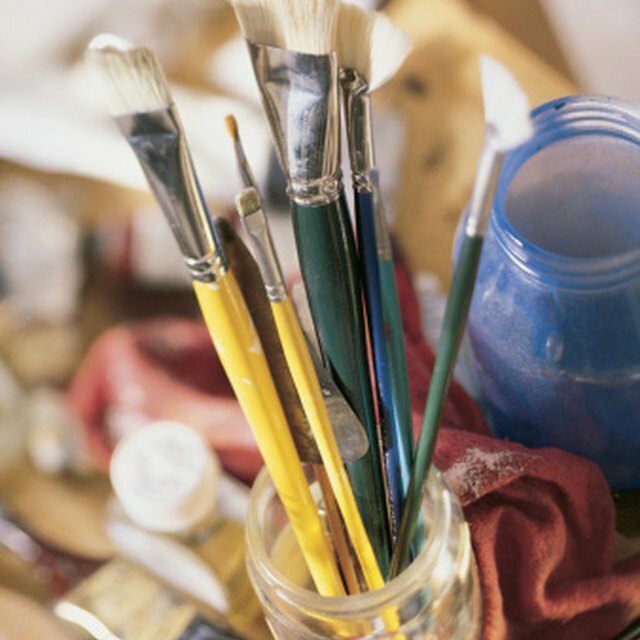 To avoid accidental ingestion, do not drink, eat or smoke while painting or in a paint studio. In case of ingestion, contact a poison control center or go to the emergency room. Do not induce vomiting. Drink two glasses of fresh water if water-based enamel has been ingested, but do not try and force water if the poisoned person is losing consciousness. Wear goggles if there is a high risk of splash. If enamel gets into the eyes, flush with water, allowing water to occasionally flow under both lids, for 15 minutes. Use an eye wash, if possible, or continuously running water from a tap. Consult a doctor. Spray enamels, oil or water based, are highly flammable. Never smoke while using spray enamel or use near flame. Store enamel paint in tightly covered containers in a cool, but not freezing, place. Dispose of in accordance of all legal regulations. What Colors Stimulate the Mind?